Christmas is my favorite time of the year, lights twinkling in windows, brightly wrapped presents under the tree and the smell of Christmas baking in the oven. Graphic 45 and May Arts are teaming up for a super fun blog hop December 12-16th! There will be tons of inspiration, fabulous prizes, incredible crafts and so much more! Behold the magic that happens when Graphic 45 vintage-inspired papers and embellishments join forces with gorgeous May Arts ribbons! Our design teams are going all out to bring you the most enchanting crafts! You'll discover lots of fabulous new ideas to inspire your holiday season! Have fun and get inspired every day of this fantastic blog hop with Graphic 45 and May Arts! Here's some fun information about these two fantastic crafting companies! Graphic 45 an award-winning scrapbook and paper crafting company­— owned and operated by a mother and her two daughters. Together we create vintage inspired crafting products that capture the flamboyant style of the 1920's and 30's - with vibrant color, irresistible texture and imaginative design to create products with decades-old appeal that's both fresh and familiar. Let our products inspire your next scrapbook layout, card, album, altered art project, or home decor DIY project. May Arts is a ribbon wholesaler, based in Riverside, Connecticut, serving over 16,000 customers worldwide. We offer an exceptional selection of ribbons, including sheer, satin, grosgrain, silk and a variety of patterns and prints. We also maintain a steady stock of inventory so that orders can be fulfilled immediately. As one of the country’s leading wholesalers of decorative ribbons, May Arts has been providing superior products and the highest level of customer service for over 25 years. Below is the schedule for the blog hop. Don't forget to leave a comment on each of the blogs for your chance to win one of two amazing prize packs. Winners will be announced on Monday December 19. For my project for the blog swap I decided to create a hanging snowflake ornament from the Christmas Emporium collection. To create the ornament, I purchased two wood snowflake cut-outs from the local craft store. To begin the project I painted each ornament with two coats of silver paint. While the second coat of paint was still wet I sprinkled them with silver glitter, allowing the glitter to dry into the paint rather than having to apply a layer of adhesive over the paint. Once these two wood pieces were dry I adhered them together with foam mounting tape to give them dimension. To create the green patterned paper layer, I cut two strips of paper 12 inches in length and joined them together. I then cut along one of the edges with a Martha Stewart Lace punch. I then joined the two remaining ends to form a circle and using my hot glue gun I adhered the center to form a rosette. The next step was to cut a large red snowflake using a Spellbinders die which I adhered onto the snowflake with another layer of foam mounting tape. To finish off the snowflake I added an additional smaller wood snowflake and several layers of paper and silk poinsettia flowers. The center of my snowflake was actually a beautiful rhinestone magnet I had been saving. I tied silver ribbon through the wood snowflakes for the hanger and then finished off the ornament with a beautiful bow tied with May Arts ribbon. 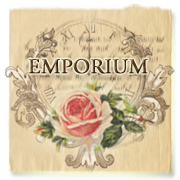 I love how versatile the Christmas Emporium collection is, imagine how beautiful an entire tree decorated with handmade ornaments would be. I made a second one of these ornaments and used it as the topper on a Christmas Gift for a very special friend. Not only does it make the gift look beautiful but she can add ribbon to it next year and use it as an ornament. Don't forget to view all the amazing projects each day this week and please leave a comment for your chance to win a prize. What a gorgeous ornament! Your work is so beautiful and elegant. Such a beautiful ornament! I love all the layering. Your ornament is beautiful! I'm going to attempt this, thanks for sharing. What a great ornament. I love the layering on this so much. Gorgeous! Love your ornaments they are so lovely and classic as always. Would love the opportunity to work with Graphic 45 and May Arts ribbon. Love the layers of gorgeousness on your ornament! Graphic 45 and Christmas go together perfectly! this is so beautiful!! man I wish I could make something this great.. thanks for sharing your talent!! Very beautiful. A truly thoughtful gift that would be a delight to receive. I can only say wow about your layering technique! Stunning. I really like the idea of an ornament. Es fabuloso! me encanta este adorno porque es muy original, Bravo! Just gorgeous!! Love them both!! Beautiful snowflake! Love all those layers! A stunning ornament...love all the glitter and layers!! Beautiful! All those gorgeous layers wrapped up into one exquisite ornament. What a wonderful idea for an embellisment on a gift or keepsake. Looking forward to more of your artistic ideas. Merry Christmas. what a great ornament. all that layering of papers and wonderful big bow.